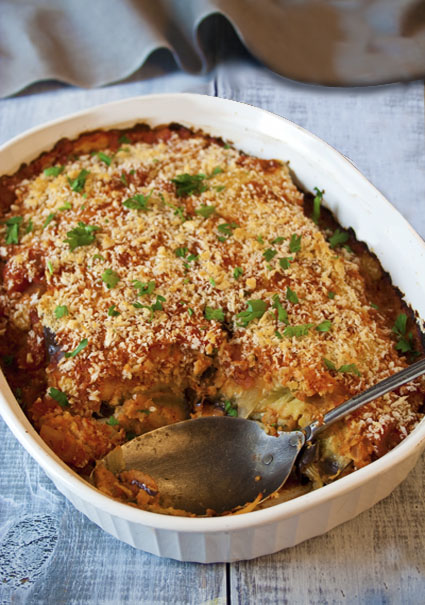 A vegan version of Eggplant Parmigiana. Only 5 grams of fat per serving and 231 calories. My other sister Pam has been having health problems and so I thought this must be about her. I braced myself for the worst. We have been waiting to get news about tests she’s been getting and if her problems were indeed cancer. Instead, the unthinkable had happened. Paige’s boyfriend had been killed in a work related accident. That was bad enough but having to deal with the sadness of that, a few days later, we got news that my sister Pam did indeed have cancer in her bronchial tube. As of writing this, we still don’t know the severity or if it has passed into the lymph nodes yet. So we are still hoping for the best. My sister Pam has smoked for decades now. I have always begged her to quit. She has tried to quit many times but it never stuck for more than a few weeks. In January she got the flu and then never seemed to recover from it. Not only that, she had been abusing apsirin for decades and was also dealing with a rare case of ulcers. The ulcers were so severe that she was and may still need surgery to remove 1/3 of her stomach. Again for years I have begged her to stop abusing her body. She never listened to me and was down right defiant. To me it seemed she was hell bent on destroying herself. I’m happy to report she has changed her tune. She has stopped smoking and stopped taking aspirin. I now have her on a whole foods, plant based diet. Because of her rare stomach condition from the aspirin abuse she is not able to eat solid foods. She had been drinking those god awful “meal replacement” drinks. Those things may help you keep your weight from dropping when you can’t eat. But they are basically a cancer sprouting cocktail. I went through the list of ingredients and was astounded. Let me go through the ingredients with you. The ingredients are U-D Water, Sugar (Sucrose), Corn Syrup, Maltodextrin (Corn), Calcium Caseinate, High-Oleic Safflower Oil, Canola Oil, Soy Protein Isolate, Whey Protein Concentrate, Corn Oil, Natural And Artificial Flavor, Soy Lecithin, Carrageenan and Lutein. I have discussed many times on this website the dangers of isolated soy protein. It raises insulin-like growth factor 1, which feeds cancer growth. The “meal replacement” drink crap is basically sugar water with cancer sprouting isolated soy proteins in it. Oh yeah, least we forget the Calcium caseinate. CASEIN! You might remember T. Colin Campbell talks about that in The China Study. The most cacogenic thing we can consume. I was reading the reviews on amazon.com for a certain brand of “meal replacement” drinks. Cancer patients who are unable to eat are drinking this stuff. People with health problems thinking that this is going to make them stronger. It’s rather shocking and disgusting. So what do you eat/drink when you can’t get solid food down? Pureed vegetables and vegetable broths are good but not enough calories. I created a special recipe for my sister that equals the calories of the “meal replacement” drink but minus the cancer sprouting ingredients. 5 Cups Rice Milk,Â 1 1/4 Cups Coconut Milk, 2 Tablespoons Black Strap Molasses, 2 Teaspoons Vanilla and 2 1/2 Tablespoons Canola oil. This may not be the best alternative but it has to be 100 percent better than what she was drinking. I don’t share a lot of personal information on this blog besides the rare entry about my garden. But I thought it was important to share this. After all this blog is about health and taking control of your health. Can everything I’ve learned since I began changing my lifestyle back in 2006 save my sister’s life? Can we help shrink the tumor and stop the spread of the cancer in her bronchial tube by changing her diet to a whole foods plant based diet? This we will find out. To anyone with advice please comment. I’d love to hear from doctors and specialist who can give her advice.